Yeah…we are doing the happy dance to have new business cards that are legible, current, concise and memorable. The sunflower is our adopted logo, and in this version it is a statement. We loved the vibrant colors and the graphic presentation that jumps at you immediately. Our previous cards were on a black background with white print that seemed less easy to read. It is a challenge to order online, not seeing results until the pack of cards arrive in the mail. We opted to add our blog address to the cards, and I am working on a contact form to compile a list of our followers. 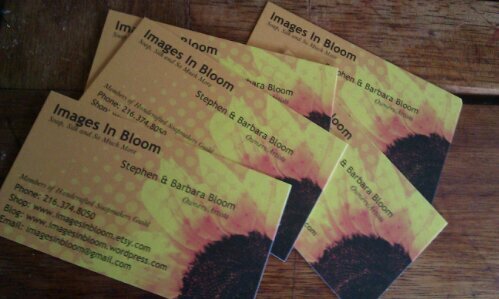 So yes, we have new business cards, ready for the busy fall season. They look great. I love sunflowers, they are so happy and friendly. Suites you!